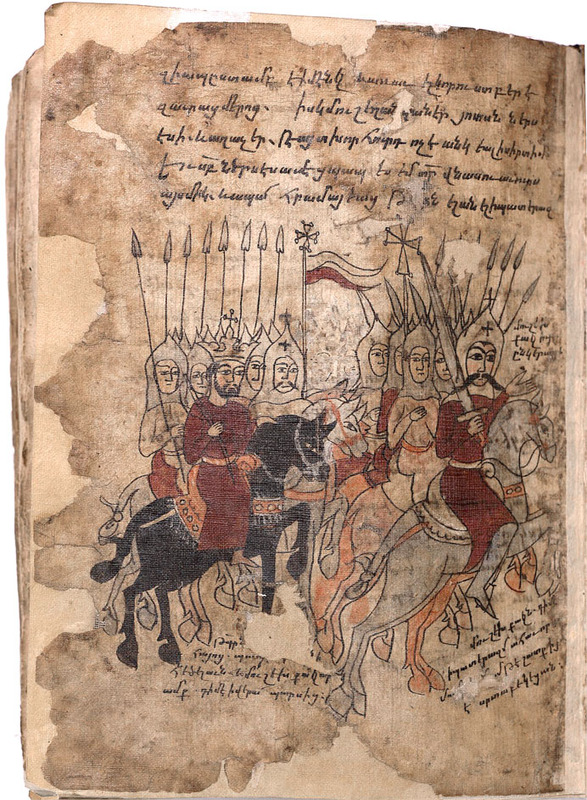 General (Sparapet) Mushegh Mamikonian (right), the King Pap and Armenian cavalry soldiers; “Azat” (azatagund) on the miniature illustrating the great victory at Dzirav over the Persian army of Shapukh II (371 A.D.). – Miniature from the 16th century. General (Sparapet) Mushegh Mamikonian (right), the King Pap and Armenian cavalry soldiers; “Azat” (azatagund) on the miniature illustrating the great victory at Dzirav over the Persian army of Shapukh II (371 A.D.). Miniature from the 16th century.